AYALA LAND, Inc. will not cut its spending for next year despite the threat of slowing demand as a result of the global economic downturn that started in the US. Jaime I. Ayala, president and chief executive officer of Ayala Land, said the company was looking at either matching its budget for projects this year or increasing it further. The property arm of the country’s oldest conglomerate will finance the projects with its own cash and through bank loans. “The company currently has over P20 billion in capital expenditure, the highest ever that the company has allotted for its projects,” Mr. Ayala said. Ayala Land allotted as much as P24.3 billion on projects and capital expenditure this year, an increase of more than half from its P16.2-billion budget last year. 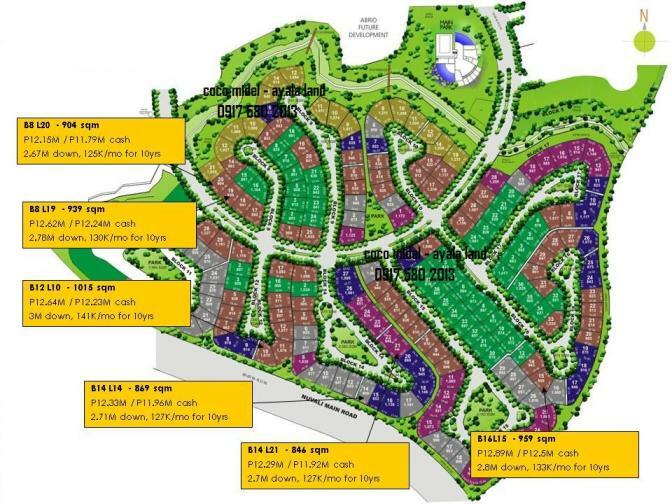 But the company does not expect to spend the whole amount due to slowing demand for real estate. As of September, Ayala Land had spent P12.2 billion. Mr. Ayala noted that while the company had yet to decide how it will distribute the capital spending to its units, Ayala Land remained active in the construction of its projects. “There will be no downsizing in our capital expenditure next year and all projects will be finished on time,” he added. He said the group would remain aggressive next year, even as he admitted that it was adjusting the strategy for its business process outsourcing (BPO) arm. In the third quarter, the realty firm’s net income dropped by a tenth to P1.02 billion due to rising construction material costs. Its nine-month net profits went up by almost a quarter to P3.84 billion. Ayala Land earlier said it would launch 5,622 residential units this year, 8% more than a year earlier. Property analysts have noted that while real estate companies might experience sluggish demand for high-end property units, the market for affordable and mid-priced housing continues to grow. If you are interested to know more about Ayala Land projects (prices, maps, etc), feel free to call me anytime. Thanks! MANILA, Philippines – Ayala Malls launches today its new TV commercial called “I Lov’emall.” The ad features the architecture and landscapes of its malls: Glorietta, Greenbelt, Alabang Town Center, Ayala Center Cebu, Market! Market!, Bonifacio High Street and TriNoma. It also highlights the malls’ world-class services and events and pioneering sustainable development programs. Shoppers will find quality hotel-like concierge booths that offer assistance on store locations, merchant directory, event and movie schedules, restaurant and cinema reservations, call-a-taxi services, flight and travel information and hotel bookings. The Ayala Malls’ Mobile Concierge serves as your own personal Ayala Malls’ assistant, with all the mall information you need at your fingertips. Meanwhile, the tech-savvy will be delighted to call the malls their next home as Ayala Malls now offers free Wi-fi connection in selected areas. For the physically impaired, Ayala Malls features ramps, specialized parking spaces and separate bathrooms and cubicles. “Such features are more strategically located. We also provide wheelchairs and the malls’ guards are trained to give assistance to the handicapped,” Jesena says. In December, Ayala Malls will offer shoppers “A Card” which can be availed through membership. This privilege card offers store discounts, freebies and perks. As an ongoing effort to sustain the clean and green environment and as part of its Corporate Social Responsibility, Ayala Malls incorporates global best practices in eco-friendly mall design, construction, and operations. Water used by the shops is recycled to water the 50,000 trees and over 60 species in the malls’ nurseries. Ayala Land’s Solid Waste Management (SWM), which started in 1996, is a pioneer program in environmental impact reduction. The program aims to reduce the volume of residual waste by recovering materials that can be reused, recycled, and processed into compost. As a result, the malls’ residual waste volume has gone down by 85%. In addition to the SWM, Ayala Malls also pioneered the Waste Market concept, wherein selected mall parking lots are converted to collection and drop-off points for the sale and trading of non-traditional wastes such as used appliances, car batteries and electronics devices. “Things you don’t see from a consumer’s perspective are some of the more important sustainability considerations we put in,” Maceda says. At present, Greenbelt 5, TriNoma and Serendra are using the latest in airconditioning system called ice thermal storage. Ice is produced at night when energy rates are the lowest. That ice is used to cool the malls during daytime. The group is finding more ways to save water like reducing algae build-up in the cooling tower pipelines of the airconditioning system. “This results in tremendous water savings like 100,000 cubic meters over the past few years. On energy efficiency, we save close to 6 million kilowatt hours of electricity purchased from the grid. That’s equivalent to 3,000 tons of carbon emissions prevented,” Maceda says. Since 2000, Ayala Malls has been using 20 garbage trucks a day in going to the landfill. But due to the malls’ segregation and solid waste management efforts, the number has been reduced to 3 to 4 trucks a day. When the malls’ merchants put out their garbage unsegregated, it won’t be collected. They pay P25 per bag of garbage. “This Pay As You Throw program is a means to reduce their waste,” Maceda says. The malls’ merchants have also begun shifting to energy-efficient lighting, refrigeration, manufacturing, and packaging, thereby becoming green companies themselves. The Ayala Malls’ energy conservation efforts have been recognized when it was awarded the Don Emilio Abello Energy Efficiency Awards in 2007. Last month, Ayala Malls won the International Council of Shopping Centers Asia Pacific Gold Award for Bonifacio High Street’s design innovation; Silver Award for TriNoma’s design innovation; and Gold Award for marketing excellence of Bravo Filipino: A Tribute to Filipino’s Creativity and Ingenuity, which featured a four-month long festival celebrating the Filipino creative genius during the opening of Greenbelt 5. For inquiries, reagarding any Ayala Land Premier project, feel free to contact me. The Anvaya project team has decided to defer the Seascape Ridge launch until the completion of the Seascape Ridge model units to be built on site and completed by summer of 2009. The model units will help ensure the successful launch of the project. 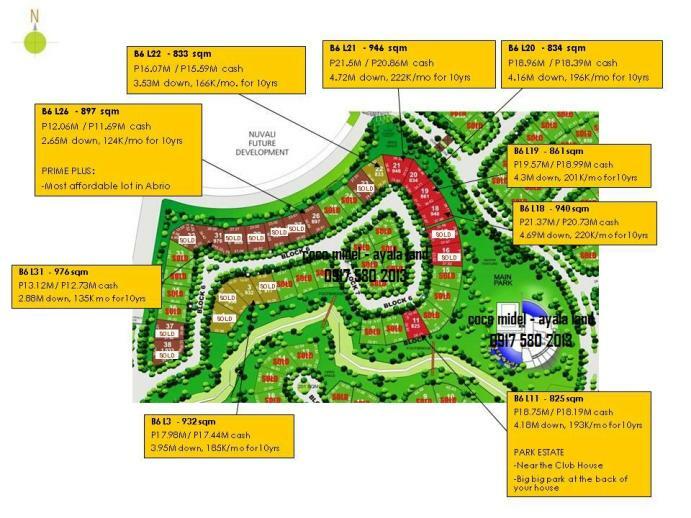 Having a physical unit that you can walk through will allow you to better appreciate the space planning, features and outdoor landscaping of the Seascape Ridge units. Moreover, the model units will provide actual unit finishes and material specifications. Thank you very much for understanding and looking forward to your continued support. Anvaya Cove Beach and Nature Club (ACBNC) in Bataan will held a season-ending spirit triathlon on November 22- 23 which offer a highly technical course that will give excitement and challenges. Participation will be limited to 100 entries with priority given to a club members and TRAP ID holdersin the race, organized by the Triathlon Association of thePhilippines (TRAP) and Anvaya Cove supported by Vitwater and Speedo. Jovie Reyes, ACBNC’s club manager said that they are elated to welcome the triathlon family to enjoy the beach and nature club facilities which are all geared for excitement, challenges and relaxation-family style. The participation of the children in the SuperTrikids events should allow bonding with their triathletes-parents. The courses are: beach swim, that will be held on the clear waters of the Anvaya Cove, bike course, that will start with a 3km hilly ride, then a 2km undulating course outside the ACBNC’s gate towards the Morong gate of the Subic Freeport and the run leg, that will cover mainly the smooth cart paths lined with coconut trees amidst verdant grass. Top three finishers and age group winners will be awarded with a medal and all finishers will receive dri-fit tee shirts and post race brunch. After the STK race, a pasta dinner will be on Saturday starting at 6:30 p.m.
You can visit their events webpage on www.triathlon.org.ph for more details. For inquiries regarding Anvaya Cove or any Ayala Land development, feel free to contact me. If you have any questions, please call Coco Midel 0917 580 2013. Below is the availability and prices as of today. 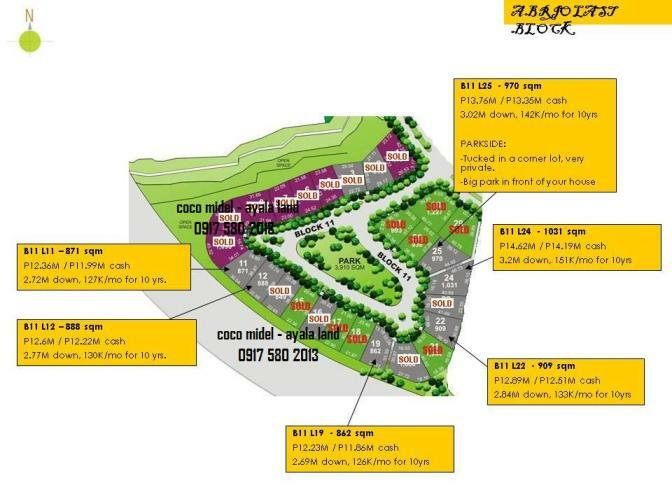 Feel free to call me if you are interested to know more about the project. I would be very glad to assist you. pls give me call at 0917 580 2013 and I will gladly give you a full presentation.